A :60 spot celebrating the Chicago Cubs' first World Series victory in 108 years. Knowing everyone near and far would attempt to own our moment, the goal was to capture the emotional impact of the culmination of the greatest journey in sports -- in the most authentic way possible. The production had to begin in secret, as the 2016 playoffs began. We first identified real fans of all kinds that were willing to be filmed, then secured exclusive rights to Eddie Vedder's live Wrigley Field concert recording of his now-famous Cubs anthem "Someday We'll Go All The Way". To deliver true emotion, crews were embedded with fans across Chicagoland throughout the playoffs and the World Series. The goal was to see real fans, with real reactions, at all the moments that mattered -- including the final and epic game 7. 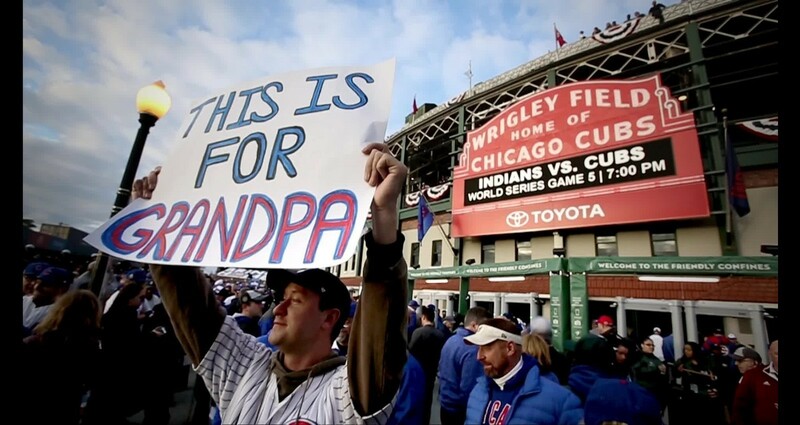 To get it on air within hours of the victory, fan celebration footage and game 7 highlights were quickly gathered, selected and edited into the final cut, which was released less than six hours after the Cubs finally won it all.